Whether you are exploring mountains of geological data, researching solutions to complex scientific problems, or racing to model fast-moving financial markets, you need a computing platform that delivers the highest throughput and lowest latency possible. GPU-accelerated clusters and workstations are widely recognized for providing the tremendous horsepower required by compute-intensive workloads. Compute-intensive applications can provide even faster results with NVIDIA GPUDirect™. GPUDirect includes a family of technologies that is continuously being evolved to increase performance and expand it's usability. First introduced in June 2010, GPUDirect Shared Access supports accelerated communication with third party PCI Express device drivers via shared pinned host memory. In 2011, the release of GPUDirect Peer to Peer added support for Transfers and direct load and store Access between GPUs on the same PCI Express root complex. Announced in 2013, GPU Direct RDMA enables third party PCI Express devices to directly access GPU bypassing CPU host memory altogether. For more technical information, see the GPUDirect Technology Overview. Network and GPU device drivers can share “pinned” (page-locked) buffers, eliminating the need to make a redundant copy in CUDA host memory. Optimize communication between GPUs using NUMA-style access to memory on other GPUs from within CUDA kernels. Optimized pipeline for frame-based devices such as frame grabbers, video switchers, HD-SDI capture, and CameraLink devices. 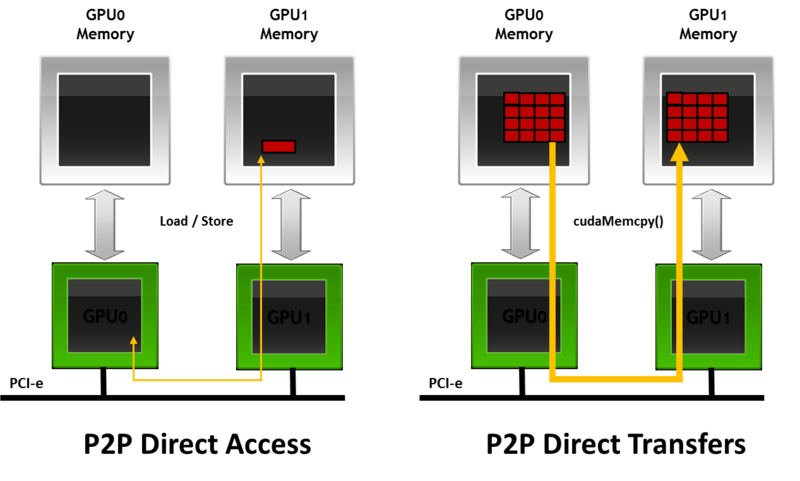 The diagrams below show how GPUDirect technologies work. How Do I Get GPUDirect? GPUDirect accelerated communication with network and storage devices is supported on Tesla datacenter products running Red Hat Enterprise Linux (RHEL). Check the documentation for possible support on other Linux distributions. Q: My company makes network adaptors / storage devices. How do we enable our products for GPUDirect? Q: Where can I get more information about GPUDirect support for RDMA? A: API documentation for Linux driver developers interested in integrating RDMA support is available in the CUDA Toolkit and online.